Adaptive strategies to mitigate climate change through policy implementation are imperative for supporting a standard that ensures the health of our planet. As part of the Administration's Climate Data Initiative, climate.data.gov provides access to Federal resources to help America’s communities, businesses, and citizens plan and prepare for climate change. Global climate change historical data in addition to projections in and beyond the 21st century. Includes four subsections (each with a Summary for Policymakers). 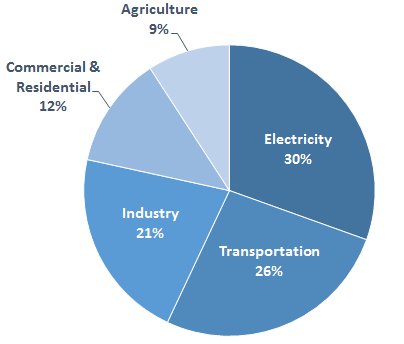 The US Environmental Protection Agency (EPA) provides an interactive data explorer to visually represent greenhouse gas emissions from transportation, electricity, industry, agriculture, commercial, and residential. Including Houstonians, more than half of Americans live in coastal counties. Two foot sea level rise along the coast, which could be reached as soon as 2050, will increase storm surges. This peer-reviewed report on climate change highlights Gulf Coast specific ecosystem vulnerabilities including hurricane paths relative to oil and gas and socioeconomic disparities. Includes climate information, tools, and training resources. Learn from local adaptation, such as the the Houston Medical Center’s resiliency initiative after Tropical Storm Allison in 2001; to be independent of the Houston utility grid for normal and emergency operations they installed a 48 MW combined heat and power plant and have implemented a stormwater management plan to reduce subsidence. EPA site that includes useful information on change, impacts, and adaptation options based on regional climate trends and scenarios.